Cardiac rehabilitation is an accepted form of management for people with cardiac disease. 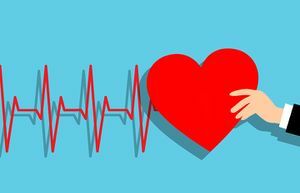 Initially, rehabilitation was offered mainly to people recovering from a myocardial infraction (MI), but now encompasses a wide range of cardiac problems. It is essential that all cardiac rehabilitation staff have appropriate training, qualifications, skills and competencies to practice within their scope of practice and recognise and respect the professional skills of all other disciplines involved in providing comprehensive cardiac rehabilitation.The cardiac rehabilitation team should actively engage and effectively link with the general practitioner and practice nurses, sports and leisure industry where phase IV is conducted, community pharmacists and other relevant bodies to create a long term approach to CVD management. Cardiac rehabilitation should be offered to all cardiac patients who would benefit. CR is mainly prescribed to patients with ischaemic heart disease, with myocardial infarction, after coronary angioplasty, after coronaro-aortic by-pass graft surgery and to patients with chronic heart failure. CR begins as soon as possible in intensive care units, only if the patient is in stable medical condition. Intensity of rehabilitation depends on patient's condition and complications in acute phase of disease. CR can be tailored to meet individual needs thus a thorough assessment and evaluation of the CV risk factor profile of the patient should be undertaken at the beginning of the programme. This should be accompanied by ongoing assessment and reassessment throughout and upon completion of the programme. Risk factors should be evaluated using validated measures which take into account other co-morbidities. Participation in cardiac rehabilitation programs should be available to all cardiac patients who require it. Age is not and should not be a barrier to cardiac rehabilitation participation. However, consideration of patient safety results in the following specific inclusion/exclusion criteria applying to participation in the Phase III exercise component. 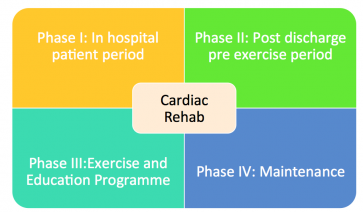 Cardiac rehabilitation typically comprises of four phases. The term phase is used to describe the varying time frames following a cardiac event. The secondary prevention component of CR requires delivery of exercise training, education and counselling, risk factor intervention and follow up. At this stage emphasis is on counteracting the negative effects of a cardiac event not promoting training adaptations (Woods, 2010). Activity levels should be progressed using a staged approach which should be based on the patient’s medical condition. Patient should be closely monitored for any signs of cardiac decompensation. The use of educational materials such as the heart manual and leaflets from the Irish Heart Foundation should be considered. Patient should be provided with an individual plan for self care and lifestyle changes based on their clinical assessment and identified risk factors. A discharge plan including exercise instructions should also be formulated. Patient should also have some form of psychosocial assessment either via interview or use of a self reporting questionnaire such as HADS, Health Related QoL. Referrals to other members of the MDT and follow up visits should also be made during this time. Promote continuing adherence to lifestyle recommendations. SIGN 2002 – state the importance of addressing any psychological distress or poor social support issues as these two factors have been identified as being powerful predictors of outcome post MI irrespective of the degree of physical impairment. Could also look into establishing links with GP, practice nurses, primary care team and chest pain services. Should take a menu based approach and be individually tailored. Typically lasts at least 6 weeks with patients exercising 2/7 minimum. Exercise class will consist of warm up, exercise class, cool down – may also include resistance training with active recovery stations where appropriate. Should include pulse raising activities (5 minutes) eg) marching on the spot, walking, low level cycle followed by stretching of the major muscle groups (5 mins) followed by more pulse raising activity. NB: should try to keep feet moving at all times to maintain HR and body temp and avoid pooling. For group rehab circuit training seems most popular. Depending on CV status and functional capacity patients may adopt an interval or continuous approach to the circuit. Separate stations are set out and participants spend a fixed amount of time at each aerobic station (30secs-2mins) before moving onto the next station which may be rest or active recovery in the form of resistance work targeted at specific muscle groups. Resistance work as set out by ACSM 2006 – 10-15 reps to moderate fatigue of 8-10 exercises. Should incorporate movements of diminishing intensity and passive stretching of the major muscle groups. Raised sympathetic activity during exercise increases the risk of arrhythmias immediately post exercise. Goal: facilitate long term maintenance of lifestyle changes, monitoring risk factor changes and secondary prevention. A patient having a stress test. Electrodes are attached to the patient's chest and connected to an EKG machine. The EKG records the heart's electrical activity. 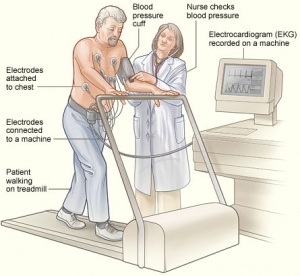 A blood pressure cuff is used to record the patient's blood pressure while he walks on a treadmill. Completion of a workload equivalent to the second stage of the Bruce protocol (7 METs) Inappropriate HR/BP response to the incremental workload. NB: when carrying out the test patients HR, BP and 12 lead ECG must be constantly assessed. Once test has terminated recovery monitoring must be continues for a minimum of 6 secs or until the ECG returns to its pretest appearance. Risk stratification is important as it will have a bearing on staffing required and group mixing. It’s also something that has to be taken into account when determining the level of monitoring a patient requires and when setting their Target Training HR. An Education Room furnished with seats, TV and DVD player and with a selection of information booklets and DVD’s provided. The size of the education room will depend upon the number of participants (patients, spouses, and staff) in the education sessions and given resources. Cardiac Rehabilitation: Putting More Patients on the Road to Recovery, American Heart Association, May 2017. ↑ 2.0 2.1 Pryor JA, Prasad SA. Physiotherapy for Respiratory and Cardiac Problems. Philadelphia: Elsevier Ltd, 4th Edition, 2008: 14 (470 - 494). ↑ 3.0 3.1 American Association of Cardiovascular and Pulmonary Rehabilitation Robertson, L (Ed.) (2006) Cardiac Rehabilitation Resource Manual. Champaign: Human Kinetics. ↑ British Association of Cardiac Rehabilitation. “Risk Factors” in Brodie, D. ed. (2006) Cardiac Rehabilitation: An Educational resource. Buckinghamshire: Colourways Ltd.
↑ American Association of Cardiovascular and Pulmonary Rehabilitation Williams, M.A. (Ed.) (2004) Guidelines for Cardiac Rehabilitation and secondary Prevention programs. Champaign: Human Kinetics. ↑ 9.0 9.1 British Association for Cardiovascular Prevention and Rehabilitation. (2012) The BACPR standards and core components for cardiovascular disease prevention and rehabilitation 2012. 2nd Edition. London: British Cardiovascular Society. ↑ 10.0 10.1 10.2 10.3 Association of Chartered Physiotherapists in Cardiac rehabilitation (2009) Standards for Physical Activity & Exercise in the Cardiac Population. ↑ Bjarnason-Wehrens, B. Mayer-Berger, W. Meister, E.R. Baum, K. Hambrecht, R. And Gilen, S. (2004) ‘Recommendations for resistance exercise in cardiac rehabilitation. Recommendations of the German Federation for Cardiovascular Prevention and Rehabilitation’. European Journal of Cardiovascular Prevention and Rehabilitation, 11(4):352-61. ↑ 13.0 13.1 13.2 13.3 American College of Sports Medicine (2006) Guidelines for Exercise Testing and Prescription. 7th Edition. Baltimore, Maryland: Lippincott Williams & Wilkins. ↑ American Diabetes Association (2013) ‘Standards of Medical Care in Diabetes—2013’, Diabetes Care, 36: S11-S66.